Alpha AR Jacket - Mens is rated 5.0 out of 5 by 3. Rated 5 out of 5 by Danyboyr from Extreemly well made jacket I use this jacket bikeing to school and work every day in the Pacific Northwest, as well as hikeing and packing. I have experienced a little more wetting than I would normally like on the N40p-x fabric, especially around "impact zones" like where my backpack straps rub the fabric. I intend to wash/dry my jacket soon and see if that helps, if that doesn't work I will refinish it. The burlyer fabric on the shoulders and forearms seems to be fareing better. That said the inside is tight as a drum and I have never once been cold or felt a breeze wearing it. The cut is perfect and is roomy in all the right places. It looks great and I get compliments on it almost daily. 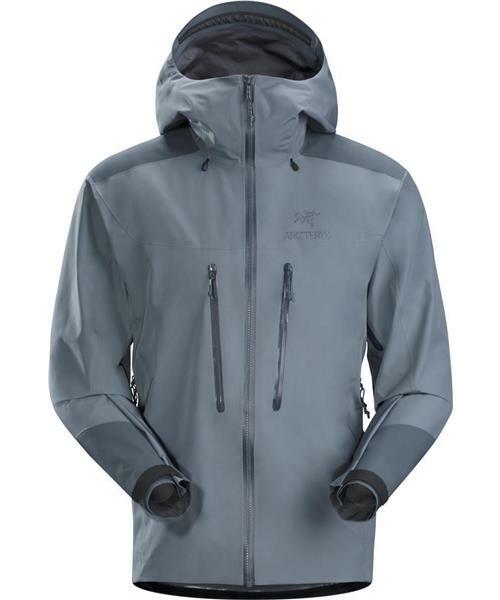 The technical details are off the chain as per usual with any arcteryx gear. Swank level over 9000. Rated 5 out of 5 by gulf from Light and versatile 182 cm at 85 kg I have L. As with all Arc jackets sleeve length is generous, which I appreciate since I have long arms. When it comes to fit I can easily wear a couple of base layers and two mid layers (i.e a Atom LT and a Nuclei) underneath when sitting still in the cold. The hood is really good and adjustable enough to work really well both with and without a helmet. But the most amazing thing is that it is so light without feeling fragile. Rated 5 out of 5 by Scatterbrain from Awesome in hail I've always dealt with poor quality jackets because I was cheap and had no knowledge of the gear. But as I've gotten more passionate about getting out there and after doing some thorough research I settled on the Alpha AR and have yet to be disappointed by it. Though I haven't gotten to use it very much, I was beyond grateful that I had it when I did. A friend and I were out hiking in the Central Cascades and got caught in a massive storm, but it wasn't snow or rain, it was hail, hail the size of peanuts, which is unusually large for Washington (minuscule for the midwest) and I didn't feel anything. Unfortunately several other people on the trail had only plastic ponchos or sub-par rain jackets and got drenched and pounded by the hail, even my friend's trusty Marmot jacket soaked through. But the Alpha AR repelled every bit of hail. I have had very bad experiences with poor rain jackets that haven't held up when I really needed them to, but the Alpha AR excelled where others on the trail failed, and kept me dry. Even my phone, which was in the cross pocket, was totally dry. Design-wise it works great for what I use it for which is just hiking and backpacking for now, though I plan on branching out toward climbing, which is why I went for the Alpha AR versus the Beta or Theta series. The cross pockets are especially ideal with a pack which was another deciding factor for me because the Beta and Theta series have pocket designs that I've heard can be a bit difficult to access with a pack on. The AR is durable enough to where I can wear it in pretty much any weather without worry, but many ounces lighter than the Beta AR and the Alpha SV, which is great when backpacking when all the ounces start adding up.